On the morning of April 15th, Kennedy students Danke Stroup, Billy T. Hernandez, Jared Mah, Avery Runner, and Kennedy Cole were involved in a car crash that killed three on impact and paralyzed one from the waist down. According to the Sacramento police, Runner- who was arrested shortly after the accident with no injuries- was still intoxicated from a party he attended the night before. His impaired mentality and vision caused him to drive into the opposite lane, resulting in a head-on collision with the vehicle with Stroup, Hernandez, and Mah. Clarion staff photo taken during mock accident event on April 3, 2017, on John F. Kennedy High School campus. 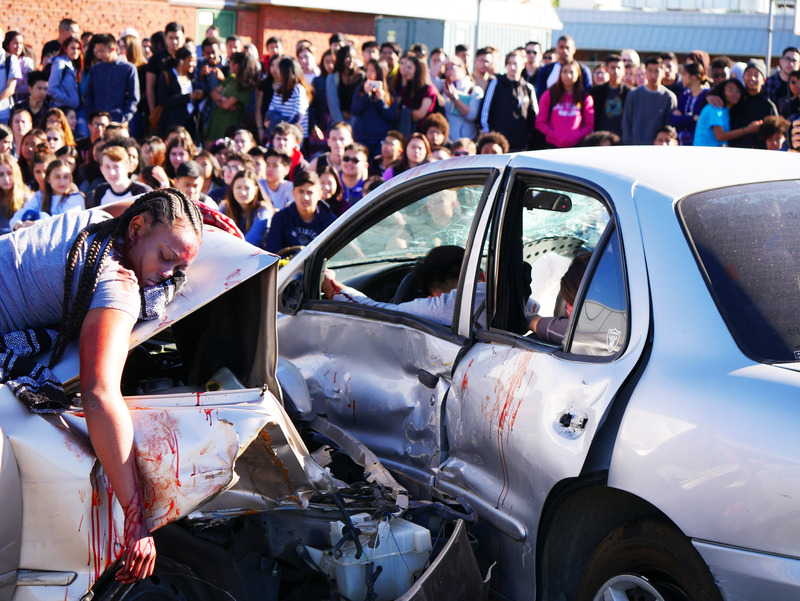 Every 15 Minutes, a program that aims to inform teenagers of the detrimental consequences that could result when one makes the decision to drink and drive, staged this event. It highlights the importance as teenagers to make the right decisions every day, especially when the lives of others are involved. The mock accident remained on the basketball court outside with to constantly remind Kennedy students of what can happen. Also, in front of the auditorium all week, students viewed an auto wreck from a 2004 real accident that claimed the life of Kennedy student Michael Alvarado. The program took place on two consecutive days. On the first day, juniors and seniors were dismissed from class to witness the scene following the accident. Rescue workers, fire fighters, paramedics, police officers, and the coroner all rushed onto campus to treat the injured and dead participants. At one point the fire fighters used the jaws-of-life to cut the roof of the car open, making it easier to access the victim. The scene that unfolds instilled a sense of reality to students who look on to the devastation with intrigue. During class, a student randomly selected from the entire student body was removed every 15 minutes to indicate how suddenly an individual could become involved in a drinking-related accident. The student was treated as if they were dead, restricted from any contact from family and friends. Uniformed officers also notified their parents of the situation. The participants, both from the accident and from the random selection, remained at school over night and experienced the loneliness of separation from loved ones. On the second day a memorial was held in the gym. Kennedy juniors and seniors watched a video that led up to the accident, witnessing how the decision to drink and drive could affect more than just the drinker. Letters read to parents from the participants, as well as letters from the parents, followed the video. The event brought tears to the eyes of the audience, further informing the importance of ensuring personal safety. The parents of Michael Alvarado, who lost their son in 2004, spoke about the pain they endure every day. Holidays were no longer the way they used to be, and Michael’s siblings also suffered from the death of their brother. Although the accident took place years ago, the family proved that no one can fully heal from the death of a loved one. Every 15 Minutes emphasizes the significance of making the right decision after drinking. It does not matter if an individual has one drink or many drinks. These actions create a drinking-related accident waiting to happen. Do they act hurt and that? I did not understand really. Is it a true story? This is ouch man if it’s real. i hope this ain’t real its so sad like i seen it twice and cried….